Charles Edward "Ed" Macauley (March 22, 1928 – November 8, 2011) was a professional basketball player in the NBA. His playing nickname was "Easy Ed." Macauley spent his prep school days at St. Louis University High School, then went on to Saint Louis University, where his team won the NIT championship in 1948. He was named the AP Player of the Year in 1949. Macauley played in the NBA with the St. Louis Bombers, Boston Celtics, and St. Louis Hawks. Macauley was named MVP of the first NBA All-Star Game (he played in the first seven), and was named to the NBA's All-NBA First Team three consecutive seasons. 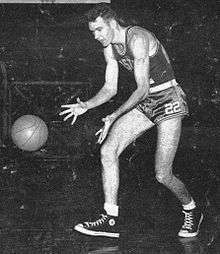 He was named to the All-NBA second team once, in 1953–54—the same season he led the league in field goal percentage. Macauley's trade (with Cliff Hagan) to St. Louis brought Bill Russell to the Celtics. In the two years he coached with the Hawks, he led them to a 89-48 record, with a 9-11 playoff record. Macauley scored 11,234 points in ten NBA seasons and was inducted into the Naismith Memorial Basketball Hall of Fame in 1960. At age 32, he still holds the record for being the youngest male player to be admitted. His uniform number 22 was retired by the Boston Celtics and he was also awarded a star on the St. Louis Walk of Fame. In 1989 Macauley was ordained a deacon of the Catholic Church. With Father Francis Friedl, he coauthored the book Homilies Alive: Creating Homilies That Hit Home. He died on November 8, 2011, at his home in St. Louis, Missouri. He was 83. ↑ "'Easy Ed' Macauley dead at 83". ESPN. November 9, 2011. Retrieved November 9, 2011.